The above drawing is by Italian artist and poet Agnolo Bronzino. The sketch was used to transfer the outline of the woman for his fresco Moses Striking Water from the Rock. 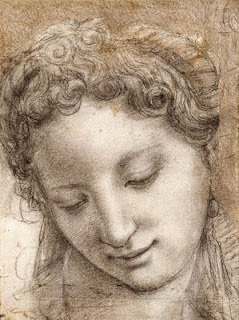 Over 60 of his drawings are featured in the Metropolitan Museum of Art exhibition The Drawings of Bronzino on view until April 18, 2010.